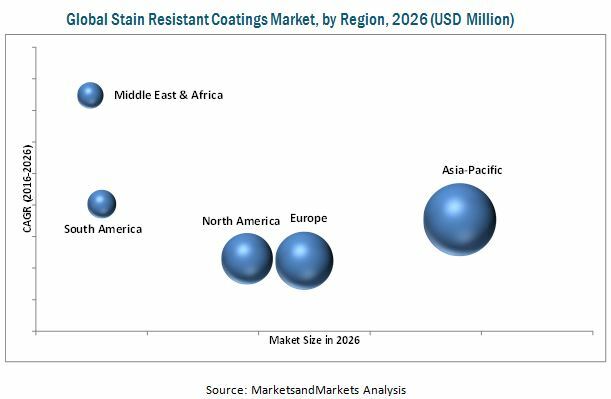 [168 Pages Report] The global Stain Resistant Coatings Market was valued at USD 2.30 Billion in 2015 and is projected to reach USD 4.60 Billion by 2026, at a CAGR of 6.6% between 2016 and 2026. In this study, 2014 has been considered as the historical year, 2015 as the base year, 2016–2021 as the mid-term forecast period, and 2016-2026 as the long-term forecast period for estimating the market size of stain resistant coatings. This study aims to estimate the global stain resistant coatings market for 2016, and projects its market size by 2026. It provides a detailed qualitative and quantitative analysis of the market. Various secondary sources such as directories, industry journals, and databases, have been used to identify and collect information useful for an extensive commercial study of the global stain resistant coatings market. 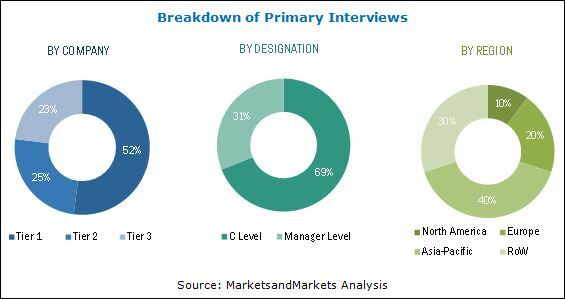 Primary sources such as experts from related industries and suppliers have been interviewed to obtain and verify critical information, as well as to assess future prospects of the global stain resistant coatings market. Stain resistant coatings are composed of polymers such as PTFE, PVDF, FTFE, PFA, siloxane copolymer, and other fluoropolymer formulations. These polymers are supplied to major stain resistant coatings manufacturers, such as PPG Industries (U.S.), Inc., Akzo Nobel N.V. (Netherlands), E. I. Du Pont de Nemours and Company (U.S.), The Dow Chemical Company (U.S.), and The 3M Company (U.S.). These manufacturers focus on increasing their regional presence by adopting strategies such as expansions and new product developments. The global stain resistant coatings market is projected to reach USD 4.60 Billion by 2026, at a CAGR of 6.6% between 2016 and 2026. The stain resistant coating industry is witnessing growth on account of technological advancements and increasing demand for stain resistant coatings from the Asia-Pacific region, especially in countries such as China, Japan, and India. In addition, regulatory initiatives driving new paint formulations to meet low VOC emission requirements serve to be another significant factor propelling the growth of the global stain resistant coatings market. PTFE, PVDF, ETFE, PFA, and siloxane copolymer are major types of stain resistant coatings that are utilized in varied applications, such as architectural coatings, cookware & bakeware, textile softeners & repellents, electronics, and transportation. The global stain resistant coatings market has been segmented on the basis of chemistry, technology, application, and region. Based on chemistry, the siloxane copolymer-based coatings segment accounted for the largest share of the global stain resistant coatings market, in terms of value, in 2016. This growth is mainly driven by the rise in demand for silicone-based stain resistant coatings in architectural coatings application. ETFE-based coatings is projected to be the fastest-growing segment in the global stain resistant coatings market, owing to the increasing usage of these coatings as a construction material in designing and moulding structures. Based on technology, the global stain resistant coatings market has been segmented into water-based stain resistant coatings, solvent-based stain resistant coatings, and others (that include multipurpose-based and oil-based stain resistant coatings). The solvent-based coatings segment accounted for the largest share of the global stain resistant coatings market, in terms of value, in 2016, owing to low cost involved in the processing of these coatings. However, the water-based coatings segment is projected to be the fastest-growing segment of the global stain resistant coatings market, due to legislations imposed on the emission of VOC from paints. Based on application, the global stain resistant coatings market has been segmented into architectural coatings, cookware & bakeware, textile softeners & repellants, electronics, transportation, and others (that include medical devices, chemical processing, and industrial equipment). The transportation segment is the fastest-growing application segment of the stain resistant coatings market. This growth is mainly attributed to the excellent properties and performance characteristics of stain resistant coatings, which make them suitable for the production of automotive components. Asia-Pacific, Europe, and North America are key regions in the global stain resistant coatings market. The Asia-Pacific region is projected to lead the stain resistant coatings market during the forecast period, owing to the increasing demand for stain resistant coatings from the architecture industry in this region. Due to economic slowdown in North America and Europe, the demand for stain resistant coatings in these regions is comparatively lower than the Asia-Pacific region. The stain resistant coatings market in the Middle East & Africa registered the highest CAGR between 2016 and 2021, owing to increasing construction activities in the residential and commercial sectors. Currently, environmental sustainability is one of the major concerns of the global stain resistant coatings market. In addition, techniques used in the polymerization and dispersion of stain resistant coatings involve huge costs and are a time-consuming process. This serves to be one of the key factors restricting the adoption of stain resistant coatings. PPG Industries (U.S.), Inc., Akzo Nobel N.V. (Netherlands), E. I. Du Pont de Nemours and Company (U.S.), The Dow Chemical Company (U.S.), and The 3M Company (U.S.) are key players in the global stain resistant coatings market. 12.8 Nippon Paint Holdings Co., Ltd.
12.12.6 Becker Powder Coatings, Ltd.